Buy Lavera Basis Sensitiv Toothpaste with Mint in the UK from our online shop or directly from our independent Scottish store. 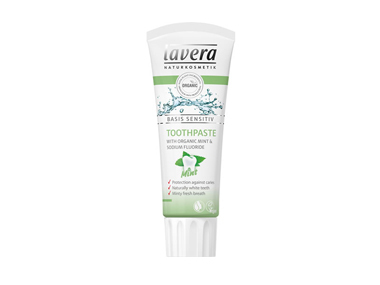 Lavera Basis Sensitive Organic Toothpaste with mint and fluoride helps to effectively remove plaque and tartar,and fight against tooth decay by hardening the tooth enamel. Lavera Basis Sensitive Organic Toothpaste with mint and fluoride helps to effectively remove plaque and tartar,and fight against tooth decay by hardening the tooth enamel. The natural minty flavour keeps your breath fresh. The formula of the organic toothpaste contains sea salt which has been carefully selected to effectively clean the teeth. Plant extracts from organic echinacea and arnica protect the gums and oral flora. When used regularly, the mint toothpaste helps to restore the natural whiteness of your teeth. As official Lavera stockist, we sell genuine Toothpastes directly from our shop in Scotland and online throughout the UK. Lavera Natural Cosmetics is the leading natural and organic skincare brand certified organic by NaTrue. View more products from Lavera. Where can you buy real Basis Mint Toothpaste safely online? If you are wondering where you can buy Lavera Basis Sensitiv Toothpaste with Mint safely online in the UK, then shop with us. We are an actual health foods shop; with real people selling real foods and products. Our award-winning independent shop is located in Stirling, Scotland since 1976. You can buy our Natural cosmetics and organic skincare and other genuine Toothpastes in store or safely place an order with us online or over the phone. Basis Mint Toothpaste - Lavera Basis Sensitiv Toothpaste with Mint in Toothpastes and Dental Care.